Retiring in Texas, where everything is larger than life. Above is probably the most recognizable state flag in the country. Texans are very proud of their state and would welcome you if this is where you choose to retire. Can you retire frugally in Texas? Sure, if you stay away from River Oaks in Houston and Mockingbird Lane in Dallas. Texas does have a lot of wealth and that won't change anytime soon. 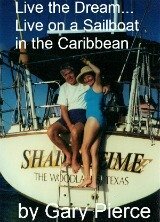 But their are several options for frugal living, park model living , RV living and my favorite living aboard a boat . It all goes back to deciding how bad you want to stop working and retire. Texas retirement offers options if you have had it at the office. We lived in the Houston area for 21 years, and Texas was the state we retired from. It was where we both worked, made friends and enjoyed ourselves. You can too if you are retiring in Texas. You will find the people warm, down to earth and friendly. 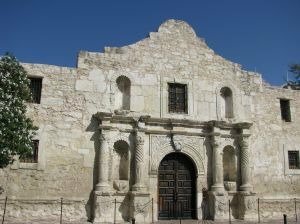 If you have not visited Texas I would do so before making a decision to relocate. Remember, try before you buy. That's the prudent way to proceed. As you know only Alaska is bigger than Texas size wise. It has more people, over 20,000,000, than every state except California. So you have got a lot of choices in where to live. Everything is supposed to be big in Texas. We'll confine our remarks to areas we know the best. This is the area around Austin (elevation 500 feet, folks that's "hilly" in Texas) and San Antonio. It is a popular place with retirees due to better weather than say Houston or Dallas. There is less humidity than Houston and it is a little cooler in the summer. The Alamo... in downtown San Antonio. Nearby is the River Walk and many great restaurants....how do you say Tex Mex? Austin is a university town that has a reputation of being "green" along with it's culture. Money Magazine rated it number 2 among best places to live for larger cities. Home to Dell Computer. The area from Galveston to Brownsville is home to retirees that want the ocean and moderate winter temperatures. It would also be a great place to live aboard a boat a very frugal lifestyle. This is a shot of Waterford harbor in Kemah, Texas. for 6 months, before taking off to the Caribbean in 1994. 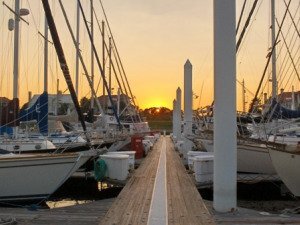 How cheap now?...$400/month (includes liveaboard fee) plus electricity. The nation's fourth largest city, and the largest in the southern US, has all you would expect from a major city. The arts, entertainment, major sports team and a international airport. Does get a little humid, but we lived there for 21 years, so it's not all that bad. Golf is played 12 months a year. 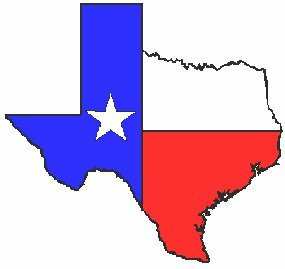 Retiring in Texas would appeal to someone looking to retire in a frugal manner. No income tax is a plus. The winters are warmer than most places. Will it work for you?